John Feinstein is one of my favorite authors. His book “A Good Walk Spoiled” is maybe the best book ever about life on the PGA Tour during the latter part of the twentieth century and one of the best selling nonfiction books ever. And Arnold Palmer is a classic. Period. 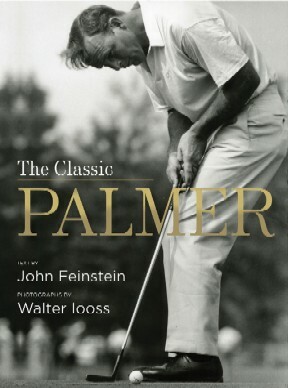 Therefore, a book by Feinstein about Palmer to my mind is a must read and I wasn’t disappointed. “The Classic Palmer” doesn’t break new ground. There are no startling revelations and no dirt is dug. It is simply a picture of the man loved and respected by millions. Sure there is an exploration of The King’s tournament record and experiences however the description of Palmer’s impact on the game, his fellow competitors and fans brings into focus why Palmer is the most important golfer ever. Not to be over looked is the photography of Walter Ioss that both exposes and celebrates Palmer with dozens of images.